The prices and the availability of the kits, components and programs listed below are subject to change. To receive a customized and current quote, please e-mail your list of desired kit(s) and options, including full name and contact information (address and tel. number) to zenair.info@gmail.com. If you have any questions, do not hesitate to write or call us at 705-526-2871. The standard kits for the STOL CH 801 HD or SD models comes with all parts to build the airframe: The complete kit includes the factory riveted wing spars, pre-formed sheet-metal parts (ribs, skins, etc. ), factory-welded parts, landing gear system and wheels, standard fuel system, controls, and all hardware required for assembly. Not included in the airframe kit: firewall-forward package, powerplant, instruments & avionics, paint, and upholstery. Assembly Drawings and Manuals included. Get a head-start on your CH 801 project by having the factory pre-assemble just the fuselage section of your aircraft. This QBK fuselage will cut assembly time by 400+ hours! The pre-assembled level of our Quick-Build kit (QBK) for the CH 801 (HD and SD models) applies to the fuselage section of the airframe as well as the wings, stabilizer and elevator. With the basic airframe factory-assembled, a builder can soon start to install the gear system, brake system, control system, windshield and doors, fuel system and electrical system. Not included in the QBK: firewall-forward package, powerplant, instruments & avionics, paint, and upholstery. The advanced airframe kit (AAK) includes all elements from the QBK/A (see above), but with a long list of additional factory-installed components (gear, wheels, brakes, controls (stick & pedals), doors, fuel tanks, etc.) see here for list, including pictures. Not included in this advanced airframe kit: firewall-forward package, powerplant, instruments & avionics, paint, and upholstery. With this program, engine, instrument, avionics and custom equipment are installed and the aircraft can be taxied prior to delivery. See here for general program information and contact Zenair to discuss available options and details applicable to a 2WW STOL CH 801 (HD or SD). * Component kits for the HD model are now only available to current builders, to complete their aircraft. Since May 2018, all new CH 801 start-ups are for the new "Duper-Duty" (SD) model. If the smaller/lighter CH 801-HD could meet all your needs for a sturdy STOL design, consider the very similar Super-Duty CH 750-SD! To ‘buy-as-you-build’ instead of ordering the complete Standard kit as a single package, you may choose to purchase "sections" (Components) of the standard airframe kit . Assembly drawings and manuals included. AeroLED: Pair of wingtip mounted three-in-one combination navigation / strobe and position lights (includes mounting hardware but no wire or switches). Available as retrofit. 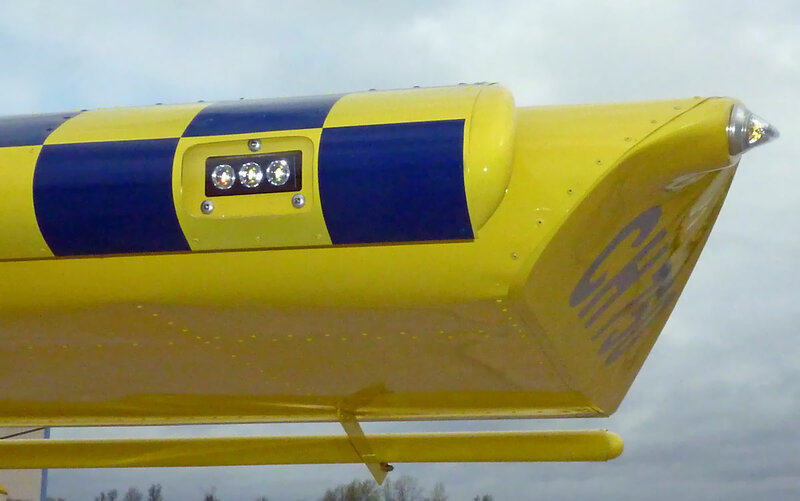 ﻿ AeroLED: Super-bright landing light (AeroLED MicroSun: 1,800 lumens, 20 watts) mounts inside the wing leading edge slat. Available as a retrofit. Order two (02) for "wig-wag" capability. Install these new vortex generators on the bottom of the elevator for even slower approach speeds. Kit includes everything you need to install the VGs to a new or existing STOL CH 801. This option replaces the standard "Y" center stick with dual control sticks. The domed bubble windows increase the cabin width to 52-inches (130 cm.) at the shoulders! Price for a pair (left and right). Retrofit. This kit includes the above windows but also the gas springs (& hardware) needed to hold up the door when the bubble windows are installed (flat doors clip to underside of wings). 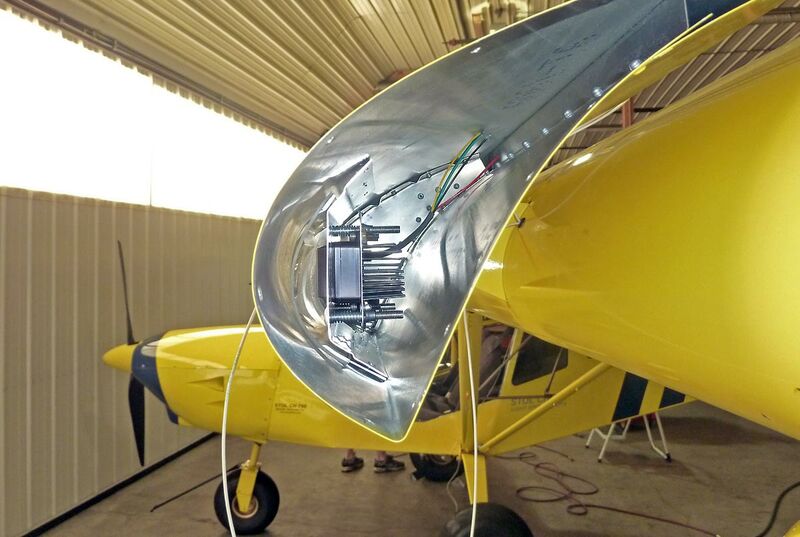 Aerodynamic strut fairing to improve the speed and looks of your STOL CH 801. Retrofit. Designed for the IO-375 engine by Aero Sport Power, this cabin heater is designed for Canadian Winters and has an added defroster bringing warm air to the windshield! For information on this, please see the CH8000. Kit prices do not include any crating, handling or shipping costs. The following crating and handling charges apply for standard kit and component kit orders. Due to the size and weight of the kits, all kit orders are usually shipped by surface freight (truck). All shipping charges are collect (Ex-Works Midland, ON CANADA). Call for a shipping quote or additional details. Note: The STOL CH 801 kit is produced and shipped by Zenair Ltd. The factory is located in Midland, Ontario, Canada, with easy access for shipping complete kits and parts across North America and the rest of the world. Provision may also be made to pick-up the crated kit at the Zenith Aircraft factory. Below are crating and handling charges. Actual shipping charges are additional..
** The cost of the rudder starter kit is deductible off the cost of the tail kit (or the complete kit), if previously purchased. Click here for details and prices on Firewall-Forward Installation Kits. Prices above are all in US funds. Prices, equipment and availability are subject to change without notice. Prices do not include crating or shipping charges (Ex-Works Midland, ON CANADA). Applicable taxes are extra.